Our Events: Patrick’s Surprise Amazing Race — Everybody's Invited! Last weekend we were thrilled to help celebrate Patrick’s 44th birthday with an amazing-race style treasure hunt culminating in a surprise birthday party with all of his friends. We were hired by Patrick’s partner of over 10 years, Russ, to help plan and coordinate the top secret mission. Patrick knew he was headed to the airport, but he didn’t know why. When he arrived he was totally delighted to see his sister Beth and his childhood friend Jill, who had both flown across the country for the occasion. Surprise #2: It’s a game! At this point, Patrick still had no idea what was in store for him. But he started to get an inkling when Beth presented him with a clue in an envelope, suggesting this was just the beginning of a series of surprises. He correctly guessed the first stop, which was lunch at one of his favorite restaurants. 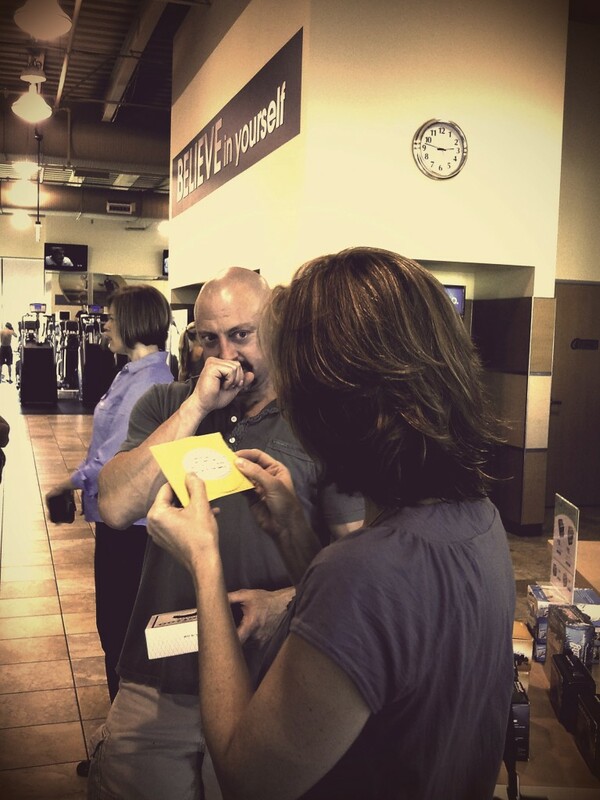 He had a chance to catch up with Beth and Jill before being given his next clue and being whisked away to the next stop. He walked into a bar he frequents and immediately noticed two friends, Robin and Dahnesh, were patiently waiting his arrival. At this point, Patrick learned that it wasn’t going to be all fun and games. He had work to do! His challenge was to beat Robin at shuffleboard. Okay, so maybe it was all fun and games. 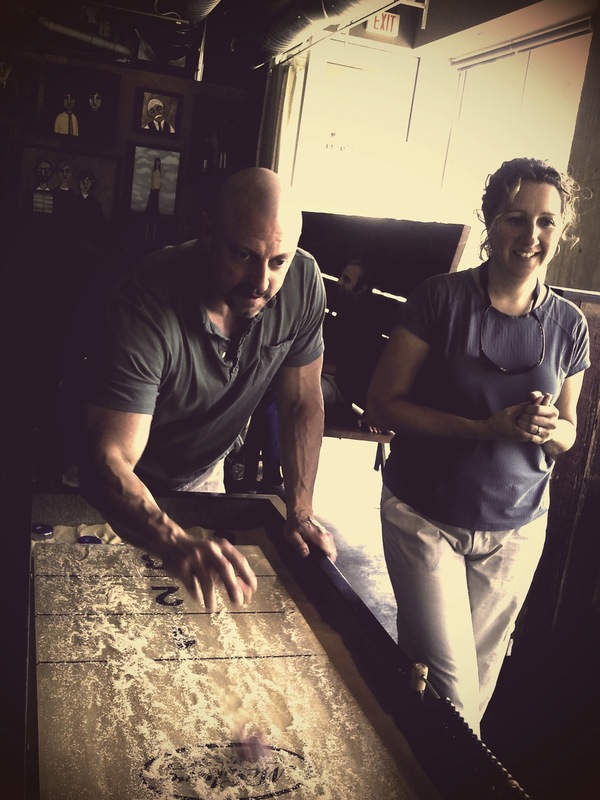 Shuffleboard is harder than it looks! It turns out Patrick isn’t that great at shuffleboard, but he earned his prize anyway (treats from his hometown), and continued on the tour, solving clues, meeting challenges, and picking up friends along the way. One of the last stops of the day was a local coffee shop where Patrick got to watch a video featuring birthday wishes from far away family members. Patrick was definitely getting tired after a packed day. Russ told him, “Don’t worry, there’s only three more stops” just as we walked into the Jade Bistro, which was actually the final stop. (Russ is such a trickster!) Patrick’s “challenge” at Jade was to deliver a dessert to a table on the upper floor. Patrick walked up the stairs and was greeted by a chorus of “Surprise!” and a ton of hugs from friends who were relieved that they hadn’t spoiled the surprise during the weeks of planning. Guests sat down to a delicious Vietnamese dinner, and toasted Patrick, whom we hope felt well loved after a day featuring family, friends, and surprise. Happy birthday, Patrick. We were so glad to be a part of your day! If you’re interested in working with us to plan a unique surprise party for a friend or family member, you can contact us. We promise to bring extra awesome.